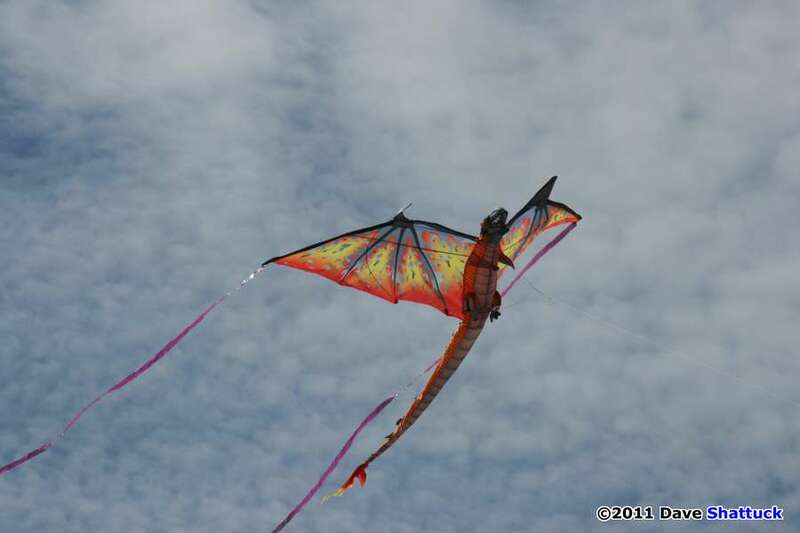 Flying high in Grayland, WA! Well, here we are… On the road again. 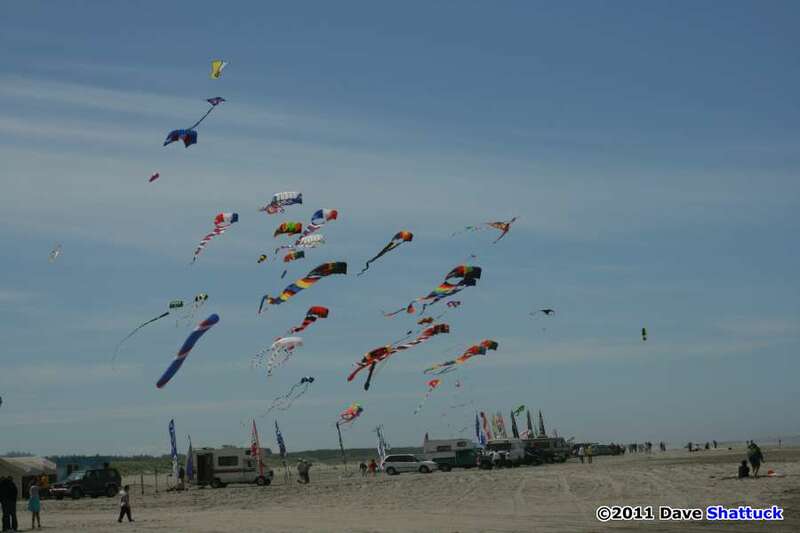 This time headed for Grayland, Washington… the scene of the annual Westport Windriders Kite Festival… and already we’re a day late! 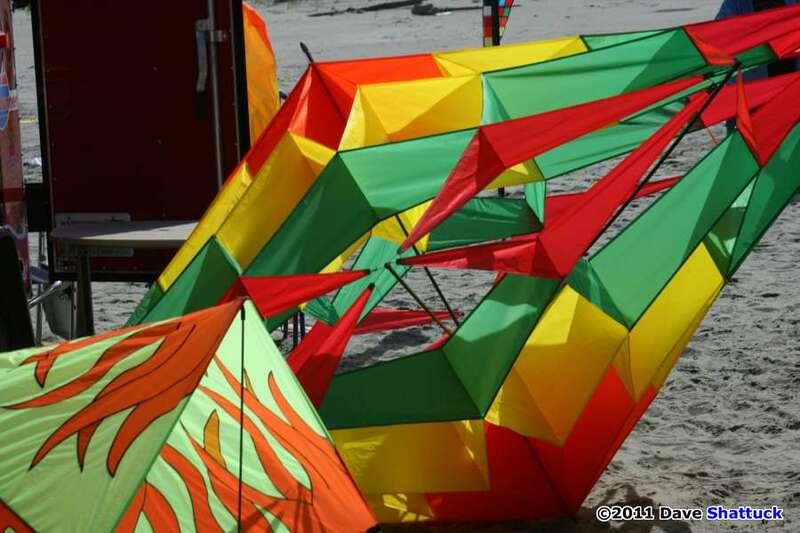 This festival runs FRIDAY through Sunday, with Friday being a day for all of the hand-crafted kitemakers to get together and “group fly” and swap tales of “How I Did It!” and “What Happens IF…” and so forth. Yeah, Theresa and I are rolling out again. 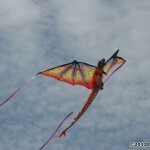 Theresa will be the Invited Kite Shop at the festival, and my old pal, Ron Gibian will be the Featured Flier. Am I charged up about this, or what? YES, I certainly am… As far as I’m concerned, it has been far too long since Ron has been up here, so I’m just pleased as punch that it’s finally gonna happen. 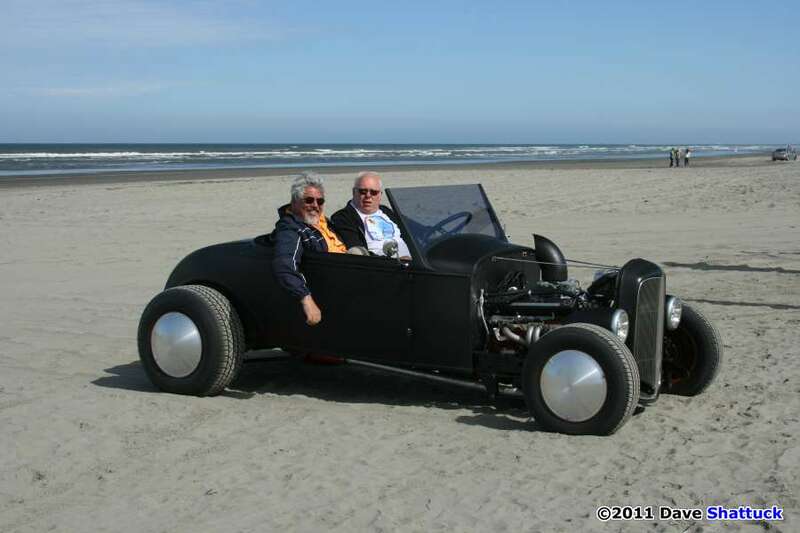 So, with Ron’s wife Sandy staying at home down in Southern California this weekend, it’s just the two of us on the beach – hanging together again. So we start out separately, with Theresa’s intent to “get there early and get myself established.” I guess that means find a place to park her truck and set up her Pop-up canopy… And if she’s the first one there, I guess she’ll have her own choice of sites, huh? 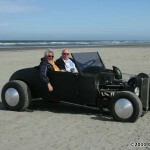 So we’re rollin, anyway – and actually make short work of it – up I-5, and then cutting over to the coast. There’re parts of that trip which occur on one of those roads “less traveled,” so it’s kind of fun to be out there on that two-lane country asphalt all by yourself occasionally. We make it to the beach about mid-afternoon just fine, and pull onto the beach from the tiny berg of Grayland, WA. And Theresa is correct… There is almost nobody present when we roll in late in the afternoon on Friday. 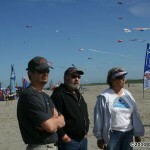 Almost… But it is nearly inconceivable to think of all of the fine people in the Westport Windriders without thinking of Ron and Marla Miller… and this year they have brought “Kevin” along from Jolly Olde England, to help celebrate kiting with us! What a lovely man he is, too! So for the entire weekend, Kevin and Marla would man the information booth… which really means that the good Kevin mans the information booth, because Marla just cannot be tied down to any one particular location for that long. Gosh – you mean someone would actually be able to find her if they wanted? No – I don’t think Marla would EVER let THAT happen! Anyway, Theresa got her rig in and her “preferred spot” located, allocated, and blessed by Marla, and all was good in the world for the moment. And so we’re on to our next mini-event – Ron Gibian and I meeting up again. “Well shoot, that’s pretty easy. 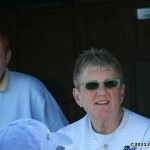 We have Ron Gibian right here in our camper,” says Marla! 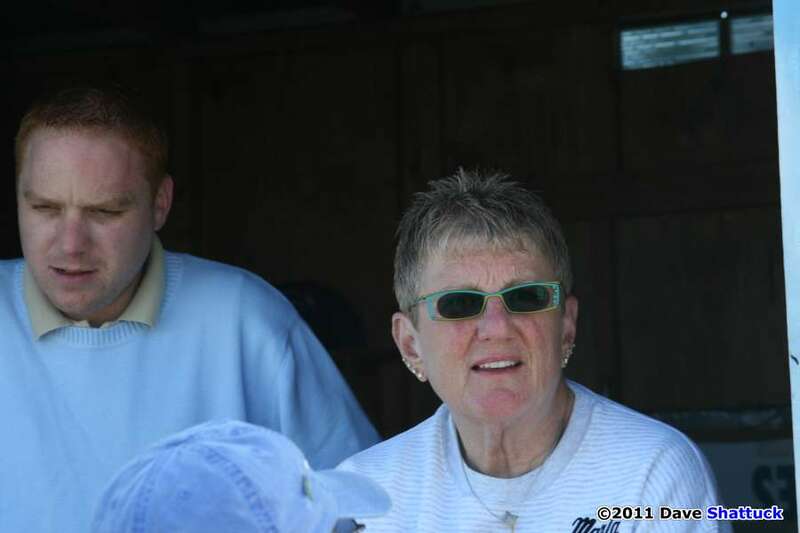 And so they do too, and soon Ron and I are back together on a beach again, and I am enjoying this tremendously too. 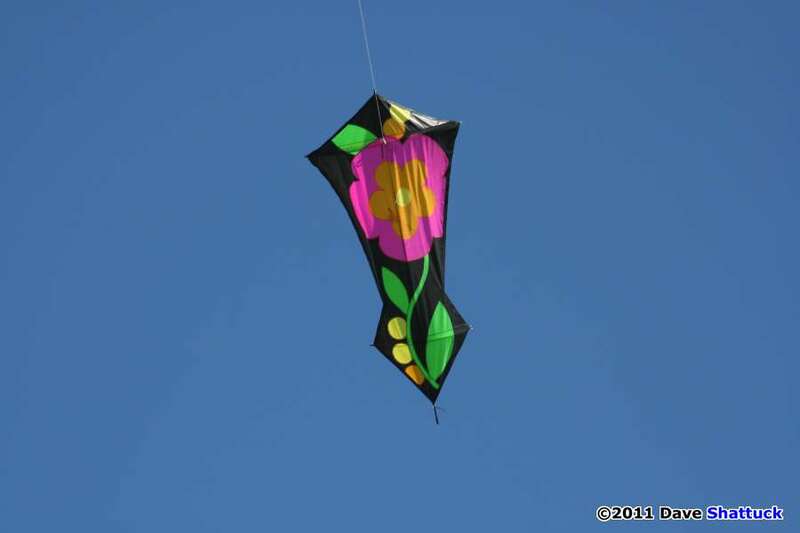 And for the remainder of the weekend, Ron and I will hang together and fly his kites (and mine that he’s sold to me, too), and laugh and joke and just have fun being – and flying – together. And I say that as if it were meant as some sort of mystical experience, and I suppose to some degree it IS mystical too. I mean – think about it. 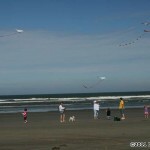 We come to the beach to fly kites. We have beach, daylight, and wind. 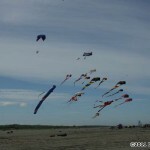 And we’ve brought kites and the associated gear to fly them. Together, we have to have well over 100 years of combined experience in dealing with sails, wind, and water. 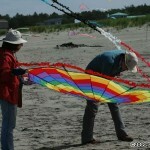 Is there any conceivable chance that we could actually “fail” to launch and fly a kite today? Absolutely NONE!!! 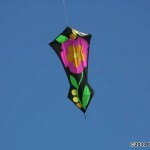 Still, however, we must “test the wind.” And amazingly – it all “works” exactly as we’d planned, too! 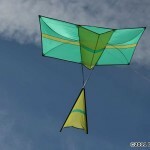 The “folly” of we old men and our thinking… If both of us fell down dead on the spot, the kite would still fly just fine! “Test the wind,” indeed! 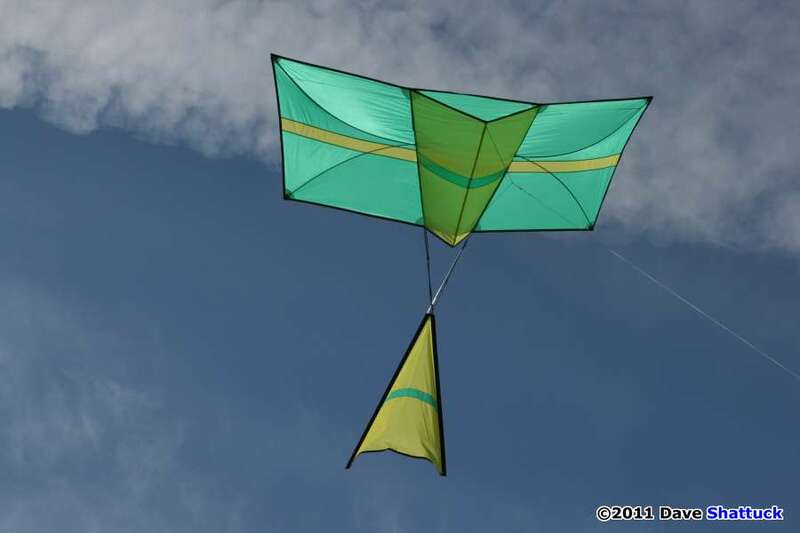 So with that little rite of passage out of the way, can we get around to the serious business of “flying kites” and “having fun?” Of course we can… Dunno if you’ve noticed it, but we’ve already started… It is the start of a perfectly good weekend! A delightful weekend for me, anyway. And a weekend that could go on absolutely forever as far as I’m concerned. Anyway, we have reunited again, Ron and I, and are set to dominate our little corner of the beach for the next couple of days. Ron has said, “You can fly anything you want, here…” meaning that he will share his assigned space as the “Invited Flier” with me… So I am indeed, quite grateful. But it has been a lengthy, if not particularly difficult trip, and it is probably time for us to take ourselves off to dinner and then to the motel in Westport and check in for the evening. Dinner was a most pleasant surprise. Ron and Marla Miller invited us to join them for dinner at Bennet’s – a lob-pitch away south from the beach access road on the highway. It turned out to be a fine-dining establishment with excellent food and a most congenial atmosphere. I was impressed with the place, and somewhat amazed that food of that caliber was available in little ole Grayland, WA. The Mariner’s Cove is an older motel, but the current managers have made some noticeable and worthwhile recent improvements, and in any case, the room is nice and clean and “usable,” which is about all we really care about. And there’s a restaurant at the beach-end of the street that has a fresh and palatable breakfast for a reasonable price. 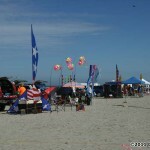 In the morning, Theresa chooses to go straight to the beach to re-establish her “turf” position and perhaps make a few sales – or at least meet the many old friends that happen to stop as they pull in for the festival… I, on the other hand, opt for the “Standard Road Breakfast” – Two over medium, limp bacon, hashbrowns with a side of butter, and I don’t care much about toast! Oh, and coffee too – always coffee! Then it’s off to the beach again. Down the other way, the “Big Toys Boys” are busy playing on the beach, too. 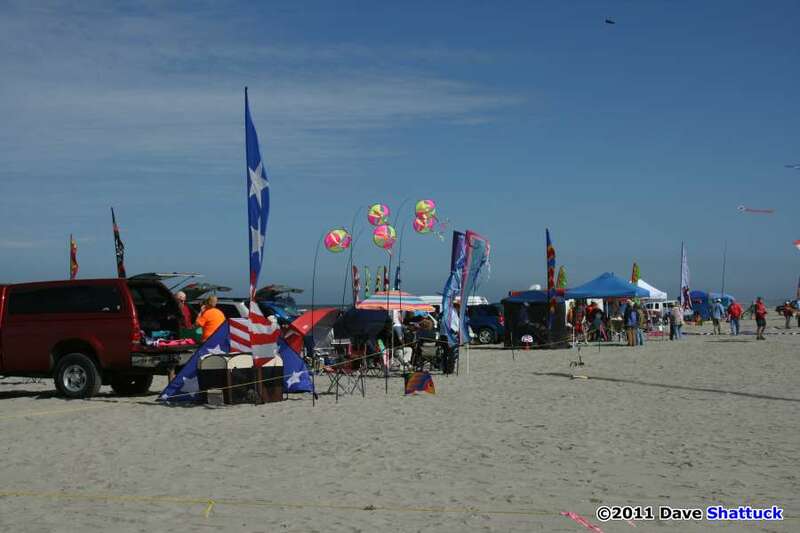 And in between, there’s the Sport Kite field just north of the entrance road, and south of us but before the big stuff at the end, are all manner of “kite camps” – mostly families or small groups who enjoy painting the skies with color, and sharing their particular joys with their neighbors… Pets, kids, families, pickups and trailers full of kites, sand-toys, a bicycle or two, and Barry Crites’ lovely new Hot Rod are all scurrying around – enjoying the day, feasting on relatively low, but oh-so-stable, breezes. 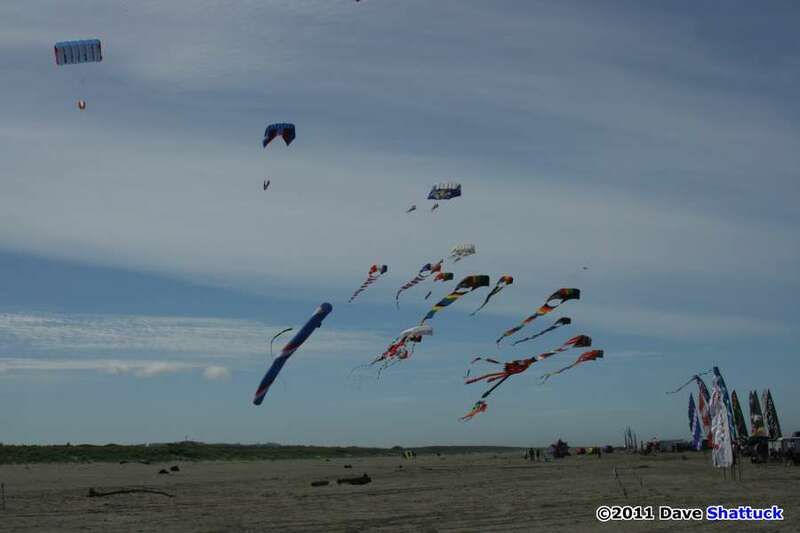 Throughout the day, those light breezes would increase just slightly – to the point where those kites originally launched during “marginal” wind-speeds would steady-up and become solid “featured” pieces hanging in the sky. 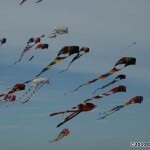 And the semi-opaque cloud cover of two hours after sunrise would slowly dissipate into nothing, leaving pale blue skies as the backdrop for a riot of nylon and polyester colors floating up there overhead. 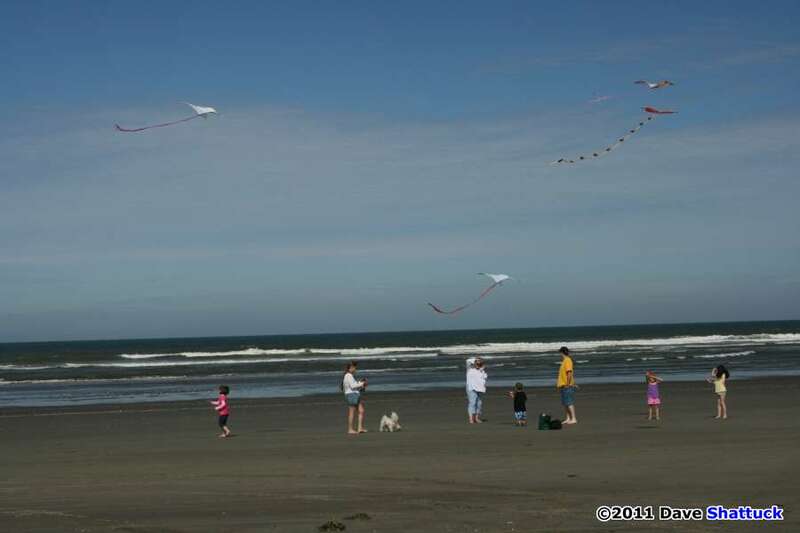 Delighted, but tweaked settings here and there when some kite exhibited its intention to wreak havoc with the other kites in close proximity… But mostly, they all stayed “well behaved” and did their jobs as planned. It was a very fine, satisfying day. But… along about 3:00 or 4:00 PM, the old saw about “What goes up, must come down” began to rear its ugly head. Like it or not, there would be an end to the day. 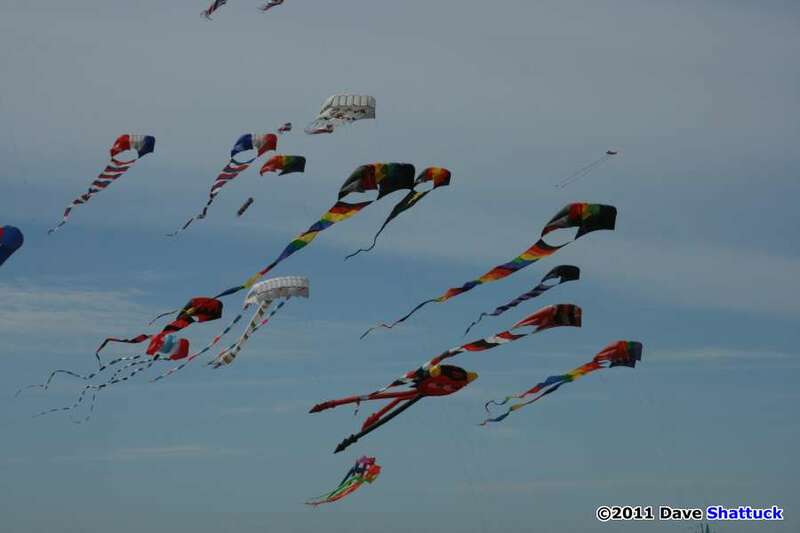 The wind began to slowly die, and those kites that had flown so beautifully all afternoon began to get “cranky” and cross lines with each other and then – one by one – started to fall out of the sky… All right, we are beginning to lose our wind. But, rather than buck the trend, why not just pull them all down and wrap them up? After all, there’s the Banquet and awards ceremonies and the raffles and auctions, out at the Ocosta Rec Center. So we eased into pulling them down at first, but once the trend was set – we worked at it with a purpose. And I discovered that there was a gigantic boon that is granted to the Invited Flier – one that I was allowed to use too. 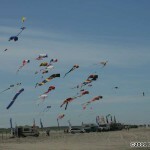 The Invited Flier gets to store is kites and gear in the Information Booth overnight. 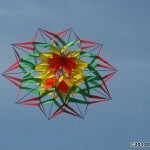 Moreover, you do NOT have to disassemble and pack away your kites. 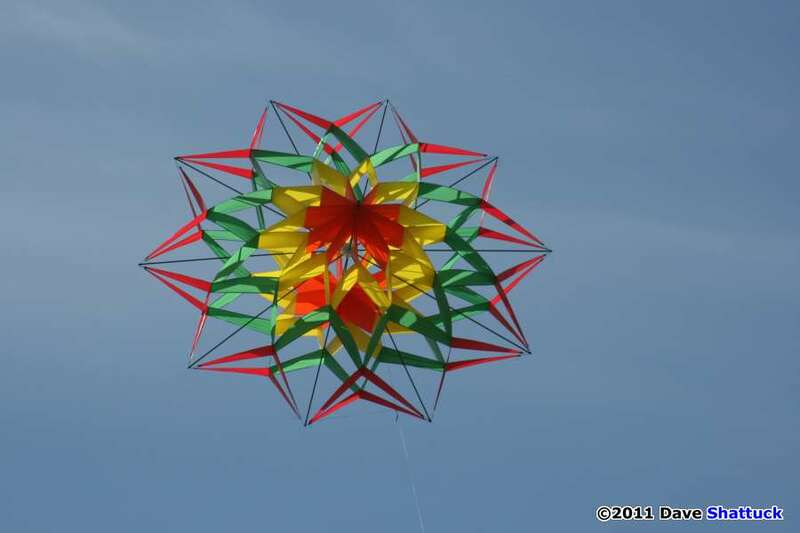 Storing them assembled and ready-to-fly is the accepted and well-expected practice! Zowie!!! 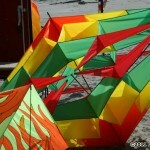 All of my kites stayed assembled and spent the night bowed and ready-to-fly. How neat is THAT, Kemo Sabe? I actually thought it was luxuriously SUPERB!!! Oh, My! Anyway, then it was back to the Mariner’s Cove again for a clean-up, followed by a jaunt to the Banquet out in Ocosta. I had a date with $30.00 worth of raffle tickets. 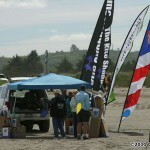 Fortunately, I managed to win three raffle prizes – all three being Tee-Shirts donated to the cause by Marla Miller. I bet I’m the only one who went to the Brookings Banquet down in Southern Oregon a week later that could say I was there wearing Marla Miller’s underwear! The next morning, we checked out of the Mariner’s Cove before heading to the beach, and I opted to take the drive down to Grayland to eat breakfast, rather than eat in Westport, as I’d done the day before. I suppose old habits die hard, but over the years, I’ve come to look forward to a breakfast at the Mutineer a bit south of the beach access road. Yeah, it might be just another “diner,” but it’s MY diner – so I filled in another check-box again on my personal list of “gotta” eateries. Then it was right back onto the beach again, and into the swing of things like I knew what I was doing. Sunday itself was a virtual copycat of Saturday as far as the elements go. No hand-crafted “judging” today was the only major change. Sir Gibian and I quickly settled into the very same routine we’d developed the day before, and all went quite well for us, save that we omitted all of the “first whack” trial-and-error flight adjustments. The day spooled off with our usual easy camaraderie. No surprised were sought or permitted. 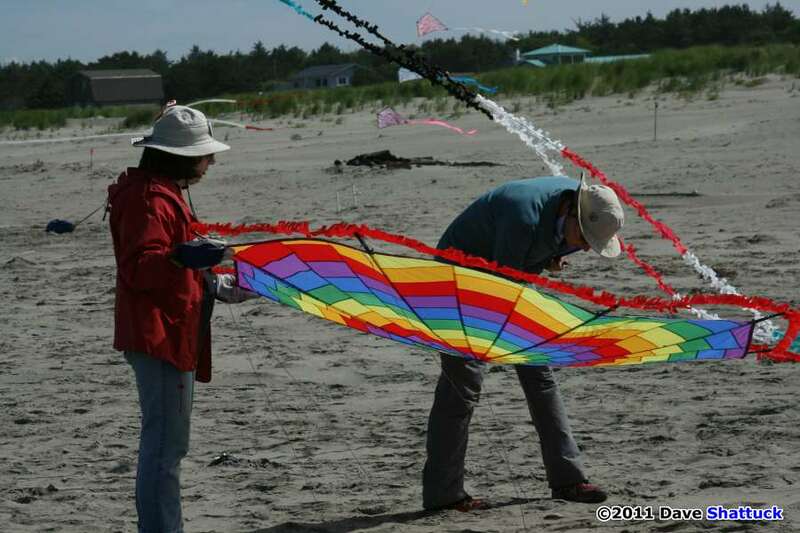 Just a couple of crusty old curmudgeons, playing with kites out on the beach – so we were well content (or at least I was… I didn’t think to ask Ron Gibian what he thought while we were sitting out there). 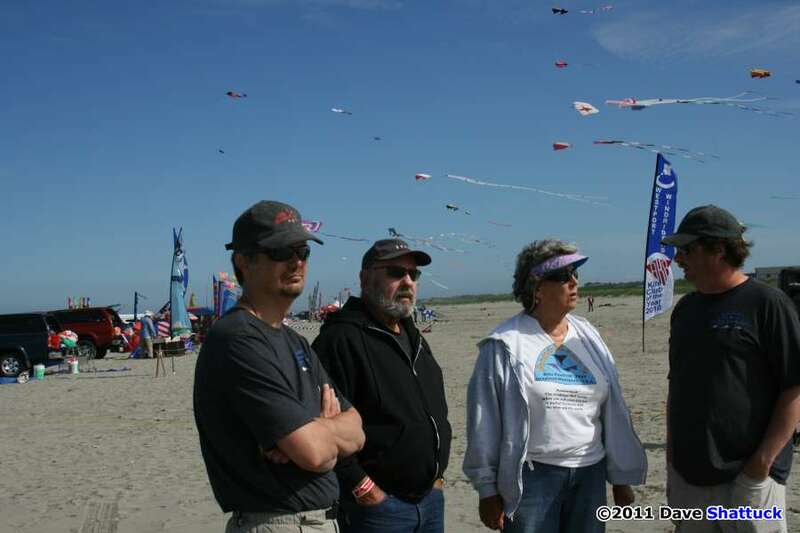 My take on stuff like that is that the real draw, the “attraction” in Kiting, is not so much in the kites themselves but rather the people who create and fly them. Over the years, my “pleasures” have centered on those sweet “companionships” developed over time, nurtured into close companionships among good friends. Who could ask for much more these days? But Ron Gibian and Kevin, along with Ron and Marla Miller, were off to Tacoma, where the Millers would put Ron on the airplane for Visalia in the morning. And me? 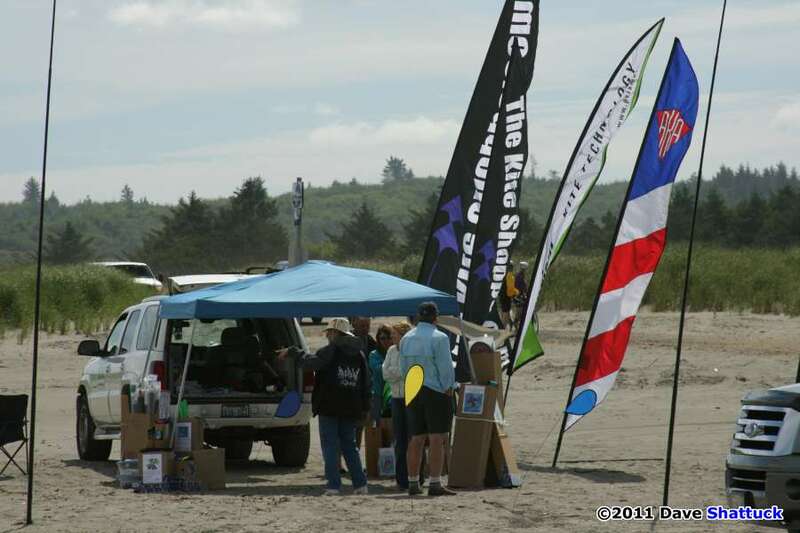 Well, I’d drive back here to Vancouver and settle in for a couple of days – then take off on yet another Kite Road Trip, this time down to Brookings, OR for the Southern Oregon Kite Festival the following weekend. Oh yeah, it’s a bit of a haul, but I’d be lucky again that weekend too! Why? Well, I’d get to see some other old buds, and I’d also get to hang out with Ron Gibian at THAT festival too. And this time, he’d bring his better half along – Sandy Gibian! This entry was posted in 2011, Issue 79 (Jul/Aug), KL Archive and tagged festival, grayland, suspended animation.